498 to 894 Sq. Ft.
Lumina Emerald City offers its residents an impeccable fusion of space and convenience. The architecturally planned 13 story towers amidst a vibrant and energetic neighborhood complements the cosmopolitan area. Canadian artist, Douglas Coupland, added Midas touch to the project by installing multi-colored totem in the urban landscape. Residents will have the access to their very-own Fairview Mall with an extraordinary collection of big brand and luxury retailers. Indulge in the abundant pool of outdoor recreation activities and explore options like cycling along the East Don Parklands. Residents can enjoy their Sundays in the 50,000 square foot master-planned Community Centre with a green roof and a rooftop garden, which is one of its kind. 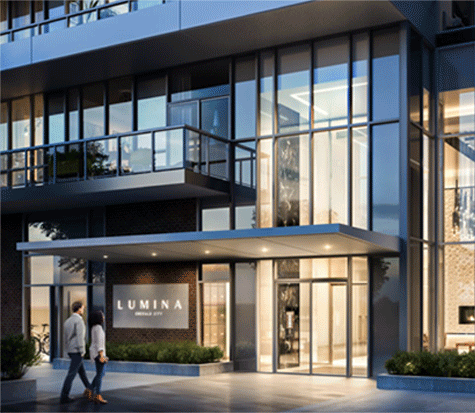 The aesthetic design of Lumina Emerald City is spectacular and unique in the entire surrounding. It positively shines. Prime location of Lumina Emerald City brings you best of all worlds. Only steps away from TTC and Don Mills subway, the project is near North York Civic Center. Residents will experience smooth connectivity with Highway 401 and Hwy 404. The project is surrounded by Parkway Forest, Fairview Mall Community, exceptional shopping centers, restaurants, movie theatres, community center, etc., The project has a Walk Score of 80 and a Transit Score of 90, residents have easy access to IKEA, Bayview Village. An immensely talented team of the group has resulted in the supreme success of Elad Canada. The company has specialization in developing mid and high-rise condominiums and master planned communities. Elad Canada has successfully made its place in key markets for developing ultra-luxury properties, since its inception in 1997. Basically, it is focused in Central Canada and has won many awards for their visionary approach towards innovative development projects. Square Yards Real Estate INC is part of Square Yards, a technology-enabled O2O transaction and aggregator platform for the Global real estate. It offers a comprehensive, integrated menu of global property & asset portfolio by using technology, data, research and diversified presence to make global real estate investments decision making more research led and driven by risk/reward perspective. Square Yards has achieved a significant scale in facilitating real estate investments worth more than USD $1 Billion to 12500+ satisfied customers worldwide through its direct presence of more than 2000 employees in 40 cities in 10 countries including Australia, Canada, Hong Kong, India, Malaysia, Oman, Qatar, Singapore, U.A.E. and the UK. Exclusive Listing: Square Yards Real Estate INC. Brokerage. Brokers protected. Illustrations are artist’s concept. Specifications are subject to change without notice. All brand names, logos, images, text, and graphics are the copyright of the owners Elad Canada. *Conditions apply. Limited time offers. Reproduction in any form, without prior written permission of Elad Canada, is strictly prohibited. E. & O. E.